Since coming to live in Alve­church more than three years ago, I have heard a number of rumours suggesting that England’s most famous playwright actually visited our village. Many of these suggest that he even wrote some of his later plays – A Winter’s Tale, The Tempest – during a stay at the Old House on Bear Hill (below right), previously the Bear Inn. In addition, there are periods in his early life when we have little information as to his exact whereabouts. While these are difficult to prove, the idea that he would journey the 20-odd miles from Stratford is not so far-fetched. So for our next production, I have written a gentle comedy – together with ADS stalwart Chris Davies – based on the conjecture that, having left his home and young family in the mid-1580s, he joined a travelling theatre company – The Earl of Worcester’s Men – who came to perform at the local Mop Fair. 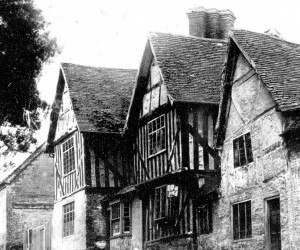 Since the 13th century Alvechurch, along with Stratford-upon-Avon, had been designated a town, mainly due to the presence of the Bishop’s Palace, and granted licences to hold regular fairs, including the annual October Hiring or Mop Fair. But why did young Will, a new father with three children including twins, leave Stratford and an apparently secure home life? There are a number of speculations surrounding his so-called “lost years”; two periods in his early life when we have no confirmed evidence of him. For example, a teenage Will is supposed to have been apprenticed to Catholic households in Lancashire – a certain William Shakeshafte is identified as a musician at Hoghton Tower near Preston! Later, around 1585, he seems to have left his young family in Stratford and some seven years later re-appears as an established actor and budding playwright in London. One suggestion commonly circulated is that he was accused of poaching deer from Sir Richard Lucy’s estate at Charlecote. This is unlikely, as Lucy – although a staunch anti-Catholic and therefore ill-disposed towards Shakespeare’s relatives, the Ardens – did not own a deer-park at that time. More possible is that Will joined one of the many troupes of strolling players, including The Earl of Worcester’s Men, who visited Stratford during that time and learnt his stage-craft with them. The rest of our play is pure invention: the local landowner and womaniser, Sir John Stafford, overrules the Alvechurch Mop Fair’s organising committee of goodwives by banning the players, but young Will persuades him to allow them to perform a new play especially devised in Sir John’s honour – an early version of The Merry Wives of Windsor – with unexpected consequences. The Merry Wives of Alvechurch, with live music by Dave Howard and members of the Alvechurch Radical String Ensemble, will take place in Alvechurch Village Hall from Thursday November 23 to Saturday November 25 at 7.30 pm. Look out for more information next month. Top: Members of ADS in Shakespearean costume at the 2016 Picnic in the Park.